Teacher Appreciation: It’s True… I Teach Because I Can’t Do Anything Else! Happy 2016 Teacher Appreciation Week! I wish to share with you one of my favorite annual postings that I dedicate to an amazing world of educators. I hope you find this reflection, one that you will continue to enjoy and share with others! Also, please take a moment to subscribe to this blog by RSS or email and join me on twitter at mjgormans . I have some great posts coming your way involving PBL, STEM, tech integration, and a continuing series on Professional Learning Communities! Most of all, thanks for being one of those over 25,000 visitors a month and over 10,000 subscribers. I would appreciate it if you pass this special post on to others through email or a retweet! Also, remember that I can come to your conference or school district and provide engaging authentic and purposeful professional development . See booking info and please contact me anytime at (mjgormans@gmail.com). Thanks so much. Michael Gorman (21centuryedtech). ASCD – To celebrate Teacher Appreciation Week, ASCD will share several free professional development materials with educators worldwide and provide opportunities for teachers to win valuable resources by engaging on social media. During each day of Teacher Appreciation Week, May 2–6, 2016, educators who follow @ASCD on Twitter and@officialascd on Instagram can enter for chances to win. 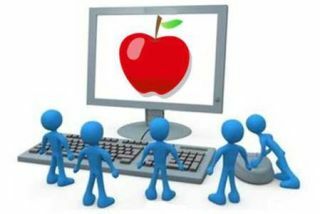 Educators can find more great resources, including free webinars, podcasts, articles, and infographics by visiting this page. GoFundMe and National PTA – As part of the #thankateacher initiative with National PTA, GoFundMe is matching $100 in donations to campaigns by or for teachers. Here’s the GoFundMe landing page with some additional details on the promotion. I can’t work as a cook or chef because while I appreciate the art in a great meal, I most enjoy finding just the right ingredients that allow for a child’s success. Michael Gorman oversees one-to-one laptop programs and digital professional development for Southwest Allen County Schools near Fort Wayne, Indiana. He is a consultant for Discovery Education, ISTE, My Big Campus, and November Learning and is on the National Faculty for The Buck Institute for Education. His awards include district Teacher of the Year, Indiana STEM Educator of the Year and Microsoft’s 365 Global Education Hero. Read more at 21centuryedtech.wordpress.com.